If you and your child have wondered what kinds of questions will appear on the fifth grade CogAT, below are some examples! These sample questions should provide you with a better idea of the quantitative, verbal and non-Verbal skills that your child should focus on, and demonstrate during the exam. All sample questions are based upon the most current version of the CogAT, “Forms 7 and 8”. Parent say to your child: Look at the first three figures. They go together in some way. Choose one more figure in the rest of the row that goes with the first three figures in the same way. Look at the numbers in each row below. 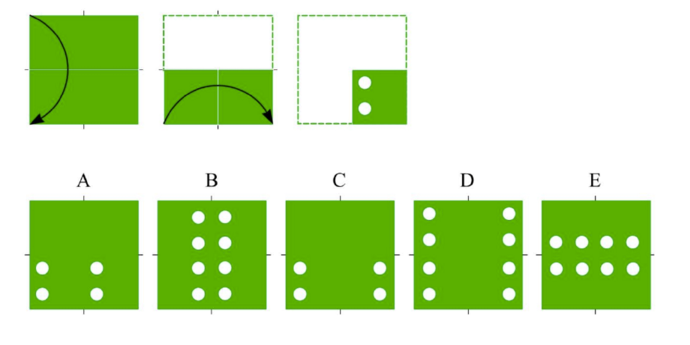 There is a rule that governs the order in which the numbers occur in the series. Figure out the rule and then choose the number that comes next from the answer choices below. Parents say to your child: on the top row, you will see how a square piece of paper is folded sometimes once, sometimes twice, sometimes three times. Holes are then punched after the paper has been folded. Choose the answer in the second row that shows how the folded piece of paper would look like after it is unfolded.